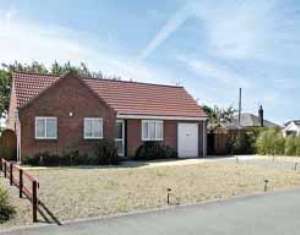 Just 200 yards from the beach, this spacious, detached bungalow is comfortably furnished. Cromer and Sheringham, 14 miles. Stalham, 6 miles, for fishing and boat hire to navigate the Broads. Norwich, 25 miles, for shopping, theatre, cinema, castle museum and cathedral. Explore Norfolk's stately homes (NT), parks and nature reserves. Shop 200 yards, pub 800 yards. All on ground floor: Spacious lounge with patio doors leading to conservatory, spacious dining room/kitchen with breakfast area, 2 bedrooms - 1 double with addtional Z-bed, 1 twin, bathroom with shower over bath, toilet & basin, utility with separate toilet & basin. Services: OFCH. All oil, power & bed linen (duvets) inc. Garage for 1 car. Parking for 1 car. H/chair. Freeview TV. DVD player (small library). Video. Radio/CD player. Elec hob & oven. D/washer. F/freezer. M/wave. W/machine. Enclosed lawned garden with patio, sitting out area & furniture. Fenced dyke at end of garden, 20 yards, young children may require supevison. One pet welcome. Easy Walking Access. Non smokers only.